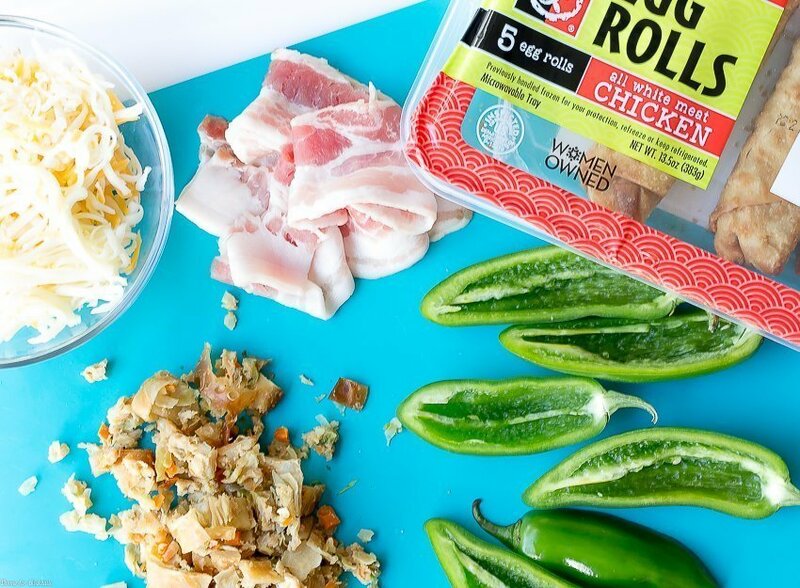 This shop for Bacon Wrapped Chicken Egg Roll Jalapeño Poppers has been compensated by Collective Bias, Inc. and its advertiser. All opinions are mine alone. #EggRollWithIt #CollectiveBias The following content is intended for readers who are 21 or older. 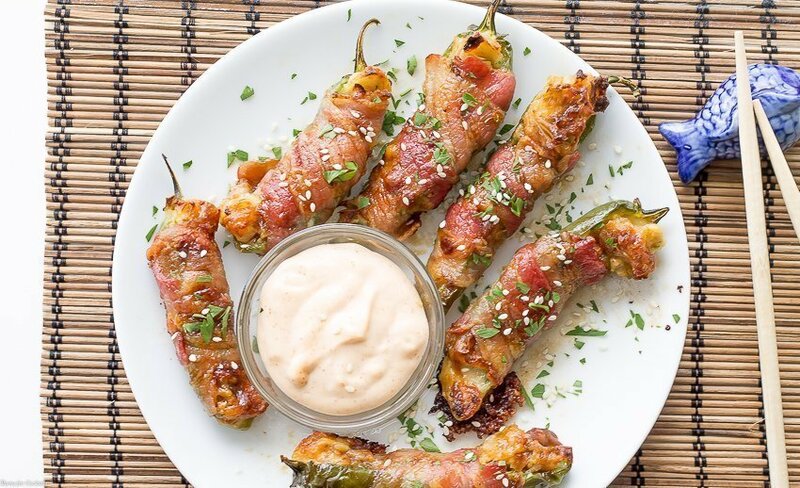 These Bacon Wrapped Chicken Egg Roll Jalapeño Poppers are a snack lovers dream. 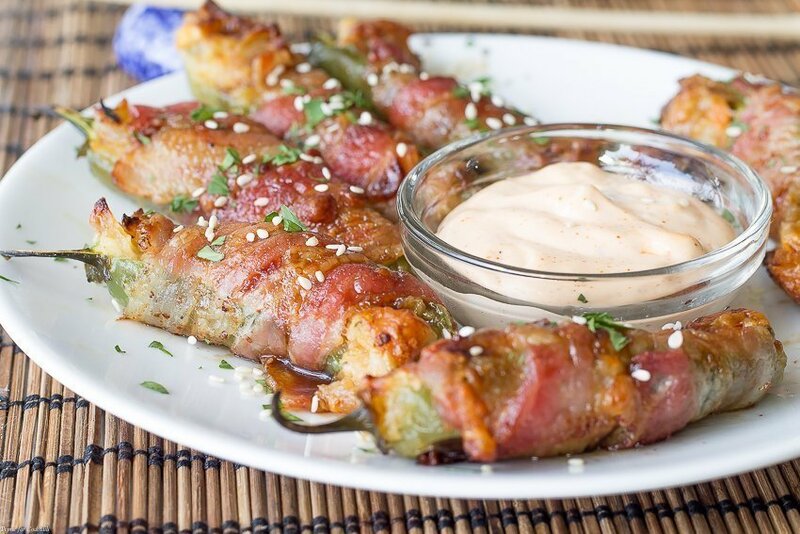 Spicy jalapeño peppers stuffed with crispy, flavorful chicken egg rolls and melty cheese then wrapped in bacon with a honey soy glaze. I have decided that we are jumping on the theme party bandwagon. If people can style their kids for first-day-of-school pictures then we can get away with a Kung Fu Date Night! 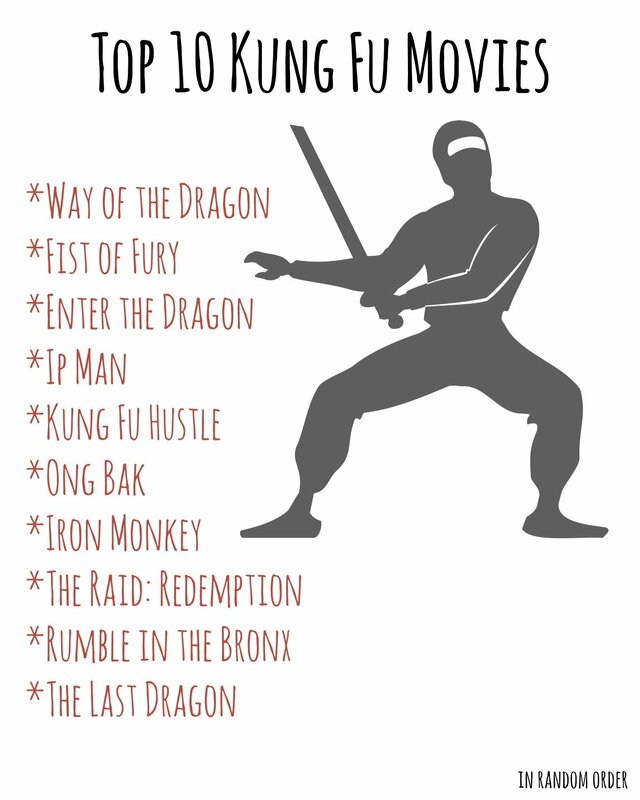 You should have seen Paul’s face when I asked him to make a list of his Top 10 Kung Fu Movies. 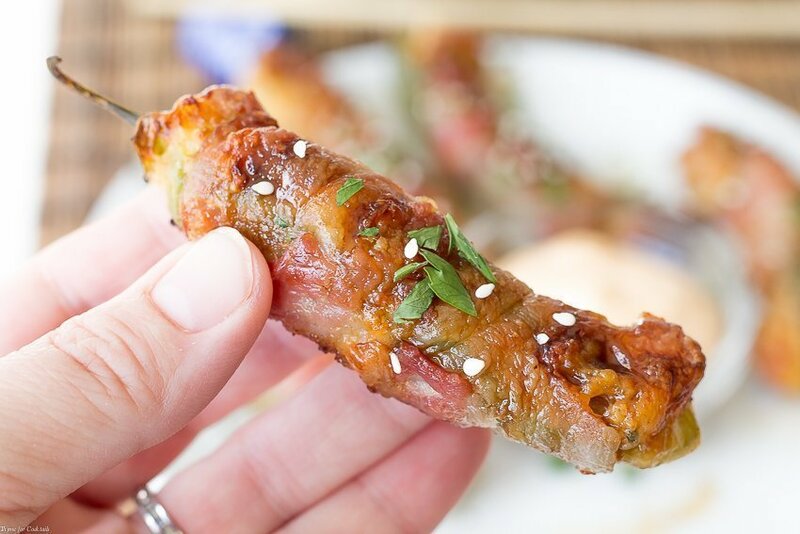 lol [bctt tweet=”Bacon Wrapped Chicken Egg Roll Jalapeño Poppers #gameday #datenight ” username=”thyme4cocktails”] And of course if we are going to have a themed date night the food needs to play a big part too. But it wouldn’t be a casa kitchen recipe without a southwest twist! My first thought was an Asian taco of some sort, because you folks know how we feel about our tacos. Until I spied the beautiful jalapeno peppers from last weekends farmer’s market trip. It had to be a jalapeno popper of some kind. So what would be the perfect southwest Kung Fu date night snack? Bacon Wrapped Chicken Egg Roll Jalapeno Poppers of course! It is an amazing fusion made with Van’s Kitchen chicken egg rolls, a little cheese and bacon. 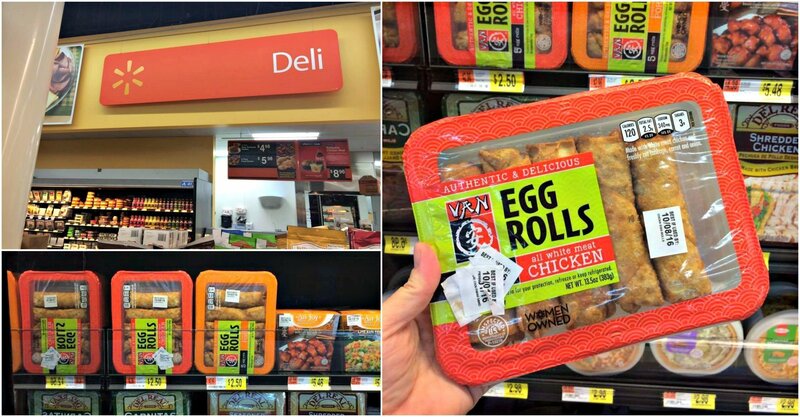 These tasty egg rolls, which you can find at your local Walmart store in the cold snack/deli area, are full of freshly chopped carrots, onions, celery, cabbage and 100% white meat chicken. Simple recipes made with quality ingredients fit right into the casa kitchen. And I love that it is a Certified Woman and Minority Owned company run by a working mom CEO with 2 teenage boys. That is something this momma can relate too. Visit their new Facebook page to learn more about this family owned company. Just look at that filling folks! 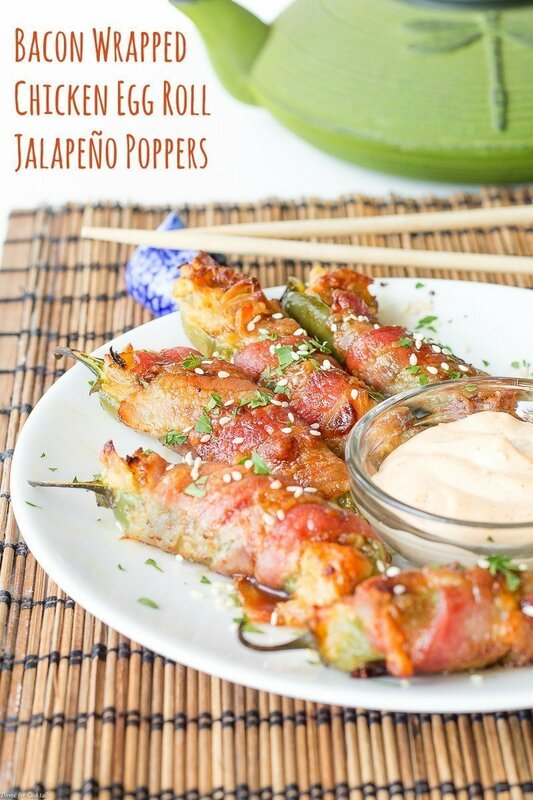 Perfect with a little sriracha mayo dipping sauce. Chop your egg rolls into pretty small pieces so it mixes with the cheese better. You can prepare these beauties up to a day ahead and keep them in the fridge. Use thin cut bacon, it will crisp up better and faster. You want the peppers charred but not overcooked and soft. Brush the glaze on last thing so it caramelizes, but doesn’t burn. 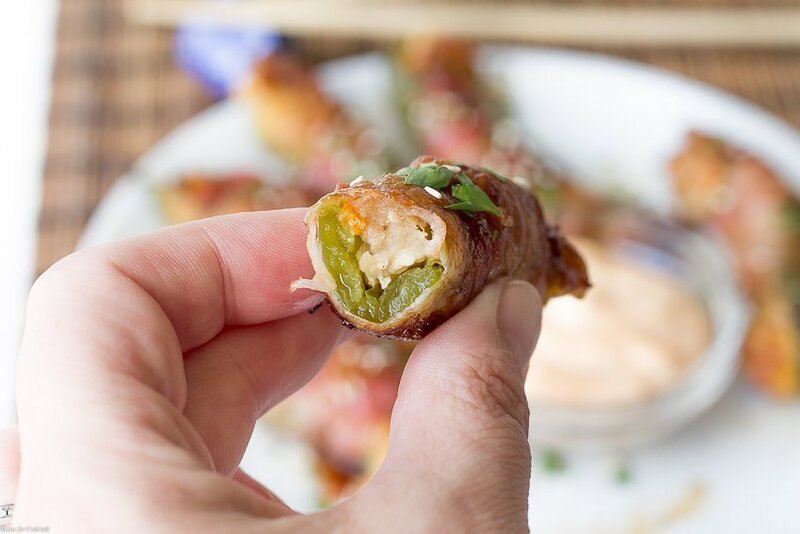 These Bacon Wrapped Chicken Egg Roll Jalapeño Poppers are a snack lovers dream. 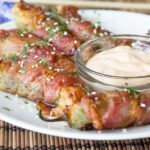 Spicy jalapeño peppers stuffed with crispy, flavorful chicken egg rolls and melty cheese then wrapped in bacon and pan-fried until charred. Heat a large cast iron skillet over medium heat. Cut peppers lengthwise from tip to stem, carefully remove ribs and seeds. Set aside. Prepare egg rolls according to package directions. Dice egg rolls and place in a medium sized bowl. Add cheese to bowl, toss to combine. Evenly fill peppers with egg roll mixture. Wrap each stuffed pepper half with a piece of bacon. Trim bacon as needed. Working in batches, place poppers in skillet, turn occasionally to brown bacon on all sides. Mix honey, soy sauce and mustard together in a small bowl. Brush on poppers during last minute of cooking.